Quinine is an evergreen tree or shrub, up to 12 m tall. This is the most frequently cultivated species of Cinchona. Flowers are white or pink, outside becoming hairless to velvet-hairy; tube cylindrical, 8.5-14 mm; petals ovate-lanceshaped, 4-6 mm, pointed. Calyx with ovary portion ellipsoid, 2-3 mm, densely pilosulous; limb 1.5-3 mm, sparsely to densely hairy, shallowly lobed; sepals triangular, 0.5-1 mm. Flowers are borne in clusters 6-23 cm across, hairy to finely velvet-hairy; bracts triangular, 0.5-3 mm; flower-stalks 1-3 mm. Leaf-stalks are 1.5-4 cm, leaf blade drying papery, ovate, ovate-elliptic, or elliptic-oblong, 10-24.5 x 5.5-17 cm, often reddened at least when young, base blunt to rounded or flat, tip blunt to rounded; secondary veins 6-11 pairs, stipules 10-25 mm. Capsules are 10-18 x 5-7 mm, seeds 7-12 x 2-3 mm (including wing). 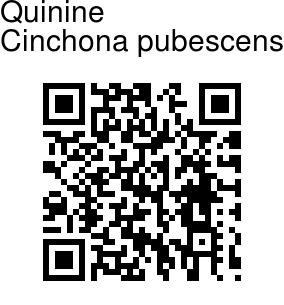 Quinine is native to Eucador, globally distributed in Columbia, Peru and Bolivia. 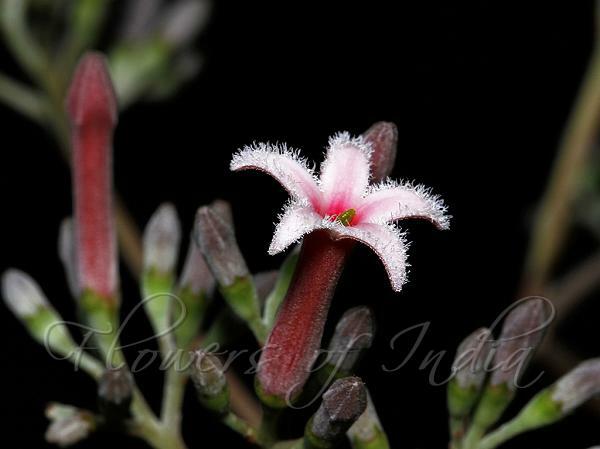 It is cultivated in South India and Sri Lanka. It has been recorded in West Bengal and Nilgiris. It thrives well at higher elevations up to 2600 m in South India. Flowering: June-February. Medicinal uses: Quinine has a long history of native use, especially as a treatment for fevers and malaria. Modern research has shown it to be a very effective treatment for fevers, and especially as a treatment and preventative of malaria. The birth of homeopathy was based on quinine. Identification credit: Santhosh Kumar E.S. Photographed in Nilgiris, Tamil Nadu.